Lives intersect in the most unexpected ways when teenagers Anne and Lewis cross paths at an estate sale in sleepy Failin, Oregon. Failin was once a thriving logging community. Now the town’s businesses are crumbling, its citizens bitter and disaffected. Anne and Lewis refuse to succumb to the fate of the older generation as they discover – together – the secrets of their hometown and their own families. 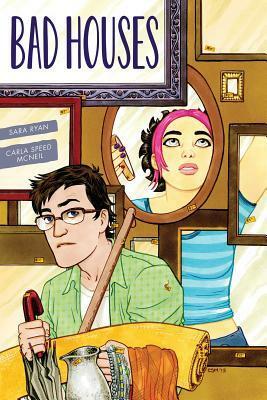 Bad Houses is a coming-of-age tale about love, trust, hoarding, and dead people’s stuff from award-winning creators Sara Ryan (Empress of the World) and Carla Speed McNeil (Finder). Bad Houses is an interesting, unusual graphic novel about sad lives in a run-down, has-been town. Failin, Oregon is on a long, downhill slide, with shuttered stores and abandoned industries. Anne and Lewis represent the next generation, seeing the lives that have come before by means of estate sales and other people’s stuff. As they grow closer and learn more about their own families’ histories and mysteries, they try to find a way not to repeat their parents’ pasts, but to create a more hopeful future for themselves. The story is warm and affecting, and often incredibly sad. The town itself just reeks of melancholy and failure, and it’s no wonder that the people still living there seem so downtrodden and disillusioned. Bad Houses is, among other things, a meditation on things — the objects that fill up our lives, which we imbue with meaning, yet which ultimately have little or no intrinsic value beyond the emotional attachments we form. We come to understand a character who is a serious hoarder; her attachment to physical representations of the loss in her life is the explanation for why her home is so dangerously cluttered. It’s no wonder that her daughter craves nothing more than empty spaces — an absolutely clean slate where life can be lived in the present without being under the constant threat of being buried by the past. The black-and-white illustrations in Bad Houses are clean and sparse, with well-drawn and well-defined characters. Anne is especially cute, with funky hair and clothes, and it’s fun to see her adapt to new situations by changing her look as well. I recommend Bad Houses for anyone who enjoys a creative approach to storytelling and a narrative that gives its characters room to breathe and grow.